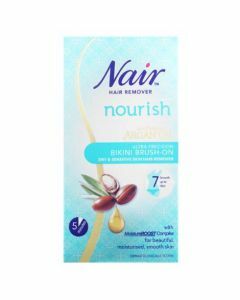 Remove your upper lip hair in just 3 minutes with the argan oil-infused Nair Upper Lip Kit. Nair Upper Lip Kit gently removes unwanted facial hair from the upper lip area. The precision tip tube allows precise and easy application for effective hair removal. Gently squeeze tube to dispense cream. Spread a thick, even layer to cover hair. Do not rub in. Leave the cream on for 5 minutes. Then check a small area for hair removal. If the hair doesn't come off after 5 minutes, leave the cream on for a few minutes longer. Gently wipe off cream and hair with a damp washcloth. Once all hair has been removed. Rinse skin thoroughly with lukewarm water.